A Secret Sisterhood. 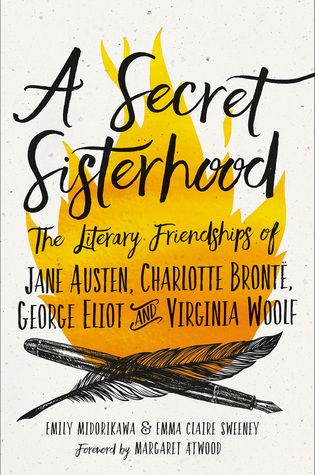 The Literary Friendships of Jane Austen, Charlotte Brontë, George Eliot and Virginia Woolf by Emily Midorikawa and Emma Claire Sweeney is another collection of focused historical biographies of famous women. (See also my review of What She Ate by Laura Shapiro.) This time, the women are all authors. The theme, or focus, of the biographies is on a particular friendship of each author with another female writer whose literary understanding and support were crucial to the careers of the women studied. Utilizing newly mined resources including letters and journals, the authors of A Secret Sisterhood explore a specific relationship of each of the four women named in the title as well as the importance of female friendships in general. Jane Austen befriended her niece’s governess, Anne Sharp, an amateur playwright. Despite the differences in their circumstances and despite chronic illness, Anne was one of Jane Austen’s most steadfast supporters. Charlotte Brontë had not only her sisters as companions, but also an old school friend, Mary Taylor, whose unconventional life challenged Charlotte to be bolder in her writing and in her life. George Eliot and Harriet Beecher Stowe were pen pals who supported each other through personal and professional crises. That one surprised me. Moreover, George Eliot seemed to be the more sensitive and generous of the two, which also isn’t what I would’ve expected. Finally, Virginia Woolf and Katherine Mansfield were rivals as well as friends. They admired one another’s talent and spent very productive time in each other’s company, but they could also be jealous, catty, and back-biting. Each of the mini-biographies is detailed and interesting. This book is a wonderful introduction to the lives of these writers seen through the lens of their friendships with like-minded women. What a wonderful book I just read! Loving Luther by Allison Pittman was utterly captivating. I’d seen the book on Netgalley and thought about requesting it because the subject interested me: a fictional biography of Katharina von Bora, Martin Luther’s wife. But I was dissuaded by the cover. (I know that’s not how I should judge a book.) The pretty, rather flirty woman gazing out from the cover made me think the book would be less serious, more of a Romance. And while I certainly read Historical Romance, I admit to being squeamish about reading one featuring Martin Luther as alpha male. However, at the end of October, with the 500th anniversary of Luther’s nailing his Theses to the church door in Wittenberg and kicking off the Reformation, bits of Luther’s biography made its way into my consciousness in various venues. The fact that he was an ex-monk who married an ex-nun is a great basis for a historical novel. So I decided to give the book a shot. I’m so glad! This is a beautiful, thoughtful story that explores the emotional and spiritual journey of this strong, independent-minded woman. We are introduced to Katharina as a six-year-old child, abandoned at the door of an abbey by a weak-willed and impoverished father. She has a good family name and memories of her dead mother, but nothing else. Nothing unless you count her deep faith, inner strength, and innate intelligence. She is befriended by two slightly older girls who teach her the ropes, along with a bit of mischief and subdued subversion. Katharina grows to young adulthood under the care of nuns. When she comes of age, despite serious doubts about her calling, she sees no choice but to take the veil. The novel portrays life in a nunnery in compelling, realistic detail–the good and the bad. Although a devoted Christian, she continues to harbor doubts about God’s plan for her. 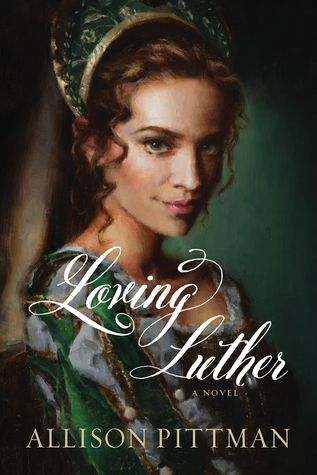 When one of her friends begins smuggling in the writings of Martin Luther, Katharina’s consciousness awakes. She becomes a leader of a group of discontented, similarly questioning women. And when the chance arises, she leads the escape, orchestrated on the outside by Luther. Luther understands the dilemma facing women who have fled the convent. They have nothing to their names. They can only hope their families take them back or that they will find husbands quickly. As he has an extensive network of friends from many backgrounds, he is quick to arrange introductions for those who need them. In the novel, at least, these introductions lead to happy marriages. Except for Katharina. There is mutual admiration and friendship between Luther and Katharina from the moment they meet. But she doesn’t jump from the nunnery into his arms. Luther is significantly older, poor, and dedicated to his work. He’s attracted to her, but tries to set her up with someone more suitable, someone with more to offer. Historically, we know how this is going to work out. Still, the pleasure in reading this novel comes from the way their relationship plays out. So without giving any more of the plot arc away, I’ll just reiterate what a lovely story it is. Pittman does this remarkable true love story justice. Highly recommended! I received this book free from Netgalley. That did not influence my review. I had a mini-vacation and wanted something light and quick to read, so I chose a Romance from Netgalley, although the vacation was in September and the release date isn’t until December, so I won’t be posting this review for a while. . . 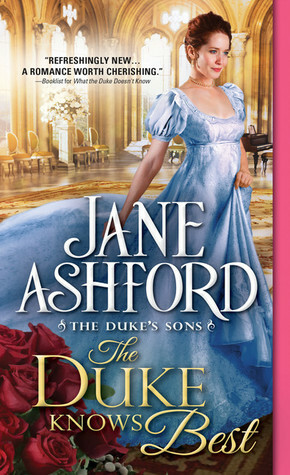 The Duke Knows Best by Jane Ashford must take its title from the old TV series Father Knows Best, because the duke is not the protagonist but rather the protagonist’s father, who comes to the rescue in the book’s final chapters. The protagonist, Lord Randolph Gresham, is not a duke, not even heir to a dukedom, but a third or fourth son who has taken a living as a "country parson." Having suffered the tragic loss of a fiancé years before, Randolph is now prepared to return to London to seek a wife. The heroine, Verity Sinclair, is the daughter of the dean of a cathedral. At twenty-four, she has finally convinced her parents that she deserves a London Season, and she’s determined to make the most of it. She’d going to find a husband who will take her out of her dull, dreary world to go adventuring. London Seasons being what they are, the two cross paths time and again. Verity continues to be unreasonably rude and Randolph tries to simply stay away from her. But at a small house party that includes musical performances by guests, the hostess asks that Verity and Randolph sing a duet. Their passion is ignited as they meld voices. The masterful duet is a stunning success. Shortly, the Prince, alerted to the new phenomenon, commands a performance and they are unable to refuse. This means forced together time. The relationship blossoms and they discover how compatible they actually are. There are subplots including a couple of silly young female friends/relatives who want to thwart convention and a Regency Mean Girl who Verity mistakenly befriends early on, believing her to be a fellow adventuress, before she understands how petty and cruel the woman is. Randolph, meanwhile, has troubles of his own stemming from an earlier career mishap that threatens to derail his future prospects in the church. The story flows along, buoyed by the steadiness and charm of the hero. As Verity matures and changes course, the reader can truly root for the resolution of their difficulties and their ultimate happiness. One of the women presented in the culinary biography collection What She Ate by Laura Shapiro is Barbara Pym, a British writer known for her comedy-of-manners novels set in small English parishes in the countryside. They generally revolve around "spinsters" who are active in their churches and communities. Clergy play prominent roles. I’m pretty sure I read a Pym novel years ago, but can’t remember anything about it. After reading the short biography in Shapiro’s book, filled with its food references and snips from Pym’s novels, I knew it was time to read another of her books. I started with the first: Some Tame Gazelle. The protagonist is Belinda Bede, a 50+ year-old woman who lives with her sister, Harriet, in a cottage next to the vicarage. Belinda is in love with the married Archdeacon, and has been for thirty years. Shy and prim, Belinda spends her time on domestic duties and good works. Her sister, who is younger and more outgoing, makes a project of each new curate who comes to the parish. The crux of the story is that the comfortable existence of these two women is upset by the arrival of two very different men: Mr. Mold and Bishop Theo Mbawawa. Mr. Mold is an associate of an old friend of Belinda’s. He is of a lower social class, flirtatious, and a drinker, and he finds himself smitten with Harriet. The bishop was once a curate doted upon by Harriet but he has moved on to missionary work in Africa. Harriet has high hopes that he will remember her fondly and possibly propose, but the bishop is rather more impressed by the quiet Belinda. In truth, the women like their lives as they are, and the intrusion of these men into their routines is more unsettling than flattering or romantic. The insights and commentary are gently humorous. The action is subdued but the novel is nevertheless highly entertaining. 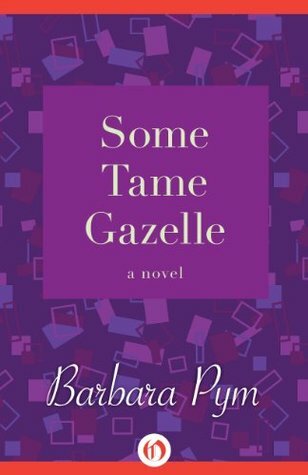 Barbara Pym has often been named on lists of "underrated" novelists. Her books have an enduring charm. My to-read pile just keeps growing!